It was on my first trip to Chicago with Dave some years ago that I really discovered Sangria. I'm convinced this was the start of my addiction because I still remember it so vividly! I can picture the night, the shape of the bar, the other patrons...and then the memory just gets dreamy! This tall gorgeous red sangria was set in front of me and everything becomes brighter and more colorful and surreal...like in the movie 'What Dreams May Come' (okay the movie itself may not have been great...) but the art direction and the colors when Robin Williams is in heaven and he picks a flower which just melts into colors in his hand... call it love, call it the booze - that's the sangria I remember! How to recreate this though? I've come to realize I will never be able to recreate this - nor do I think I want to. It's just time to make my own version. 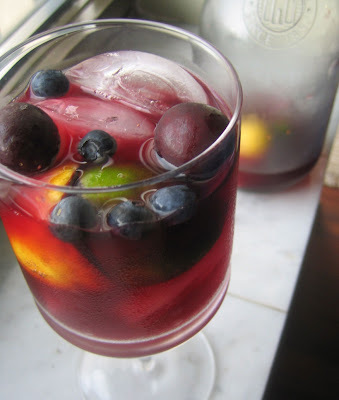 You're going to enjoy this sangria for fruity and slightly fizziness of it. I used whatever fruit I had on, so do the same. Drop in some apple chunks and or try watermelon. 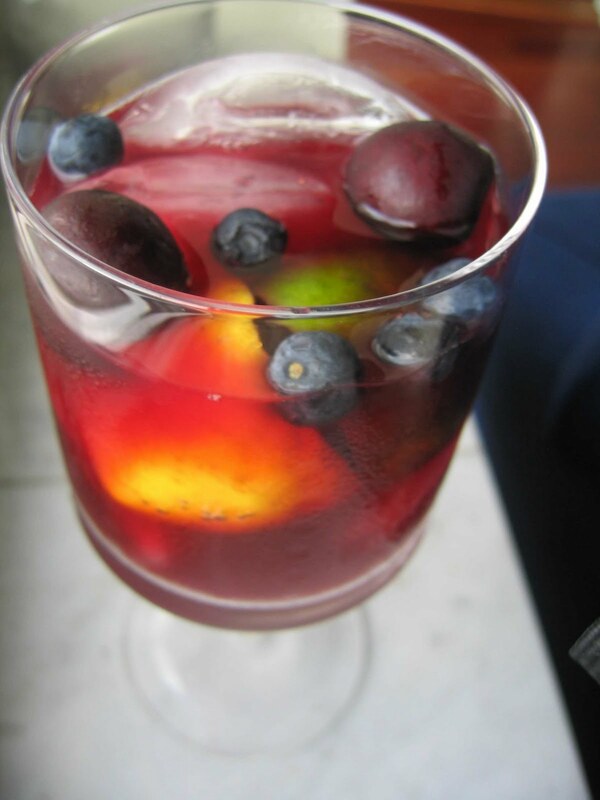 Sangria to me is just another reason to love wine and to have fun with it! Mix, drink and create lasting lively memories to be fat and happy with. Tips and Techniques: A basic red table wine works great for sangria rather than using your expensive wines. Make this ahead of time if you can to allow the flavors to meld. Serve in a tall pretty glass.